Forget the face. The all-new F56 Mini might look as though it’s been pumped full of botox, but don’t let its startled expression and puffy cheeks spoil the beauty of this car. Yes, the first new Mini hatch in eight years is kinder to wayward pedestrians, thanks to a semi-active bonnet that will attempt to cushion the blow. But it’s also much nicer behind the wheel. 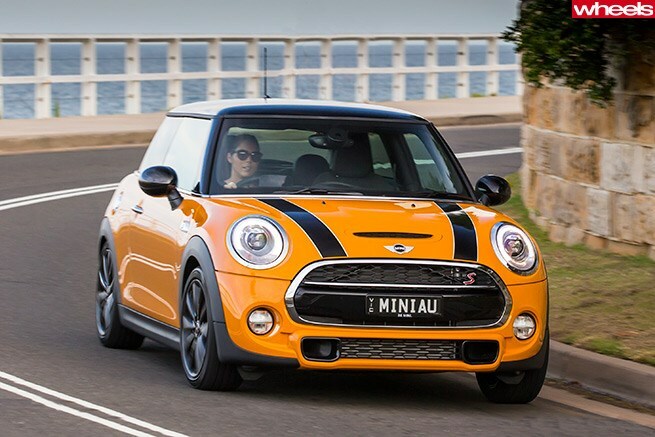 A new platform and engines make this the keenest-handling, strongest-performing Mini in history, yet it’s the razor-sharp $26,650 starting price – $5000 lower than last year’s model – that will create the biggest stir. The base Mini Cooper comes with a terrific 1.5-litre turbocharged three-cylinder engine, with enough grunt to put many a warm hatch to shame. In fine three-pot tradition, it purrs along with a charming thrum, yet when you look at the figures, this 1.5 triple is far from being just a tiddler. With a feisty 100kW, a solid 220Nm from 1250-4000rpm, and just 1085kg to haul about, the six-speed manual Cooper can hit 100km/h in a claimed 7.9 seconds. Compare that to the similarly priced 1.2-litre Audi A1 Sportback’s 11.9 seconds and you can see just how much shove you now get for your dollar in a base Mini. The $36,950 Cooper S shares the Cooper’s engine dimensions, but adds an extra cylinder to create a 2.0-litre turbocharged four. Running what must be a fairly moderate state of tune, the Cooper S punches out 141kW and 280Nm, and can reach 100km/h in 6.8 seconds, yet it’s the keen induction growl and raspy exhaust note that make the S version the enthusiast’s choice. Much as we love three-cylinder engines, we just wish the Mini’s 1.5 was a little more sporty in flavour. Its dynamics certainly deserve it. Revisions to the multi-link rear suspension have blessed the F56 Mini with beautifully fluent handling. The way it pivots on its rear end to drive its nose into a corner is fantastic, and so is its super-sharp steering, with just 2.4 turns lock to lock. We drove a Cooper manual wearing 195/55R16 tyres (15s are standard), which rode firmly, like you expect of a Mini, but adding optional adaptive dampers (a steal at just $700) to a Cooper S simply transforms its ride, without softening its brilliant handling. And that’s wearing 17-inch run-flats. In almost every conceivable way, the new-generation Mini is a vastly superior car. It’s faster, thriftier, roomier and more comfortable. It has a much classier interior, and it doesn’t cost as much if you want to individualise the way yours looks. It’s also cheaper to begin with. Most importantly, though, it’s more fun. And that’s what driving a Mini is all about.